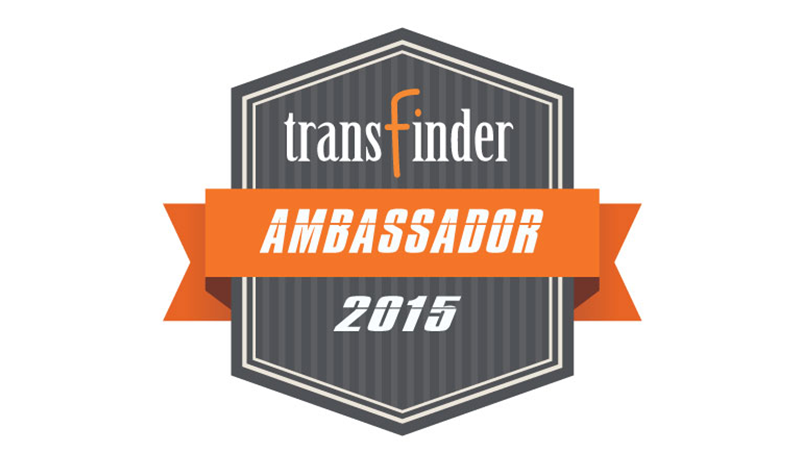 A Wyoming student transporter received the Transfinder Ambassador of the Year Award during the company's Annual Client Summit (ACS) in Austin. Another won a scholarship to this summer's STN EXPO in Reno, Nevada. Transfinder President & CEO Antonio Civitella (left) awarded Stephen Janes of Park County, Wyoming as the Transfinder Ambassador of the Year. Transfinder President and CEO Antonio Civitella recognized Stephen Janes, the director of transportation at Park County, Wyoming, School District #1 who has overseen the completion of right-hand-only bus stops for K-3 students using Transfinder's Infofinder software. As reported in the May edition of School Transportation News ("Failure to Stop"), Park County's right-hand-only stops played a big role in a young student not being involved in a crossing incident when a local Sheriff's deputy blew past the school bus at an afternoon stop last fall. Transfinder awarded this year's scholarship to STN EXPO to Raul Cruz, director of transportation at Pearland ISD south of Houston. Cruz told STN Publisher Tony Corpin, who was on hand to also present the scholarship, that this will be his first trip to the conference in Reno, Nevada, scheduled for July 25-29. In all, Transfinder ACS with the title this year "Let's Go" featured an anti-bullying keynote Tuesday by Tony Doland, who spoke on "Change Starts with Me." The message was that a change is necessary in the overall culture of our schools to create an environment that is not conducive for bullying. Transfinder consultant Dan Roberts also led a full-day workshop Monday on "Managing Student Transportation for Safety and Efficiency." It shared best practices for safety and efficiency. Meanwhile, more than 265 clients were in attendance to take part in several dozen classroom and hands-on computer sessions to assist student transporters with getting more out of the company's suite of software solutions. The event also features several new session topics such as "Managing Growth," "Analyzing and Assessing Your Map's Capabilities," "Routing Theory" and "Key Performance Indicators (KPIs)." Highlighted new Computer Lab sessions include: "Servicefinder Part 1 - Theory," "Servicefinder Part 2 - Practice" and "Field Trip Management Parts 1 & 2"
Last week, Transfinder also launched Routefinder Pro v12.0, which Civitella called "the biggest" in the company's 27-year history and the largest number of new features, including simultaneous routing, a map for every grid, a "read-only" version of routes and the ability to more easily route unassigned students to stops. Routefinder Pro v12.0 will have the same system requirements as version 11.3 and will be available this summer for preparing routes for the upcoming school year.